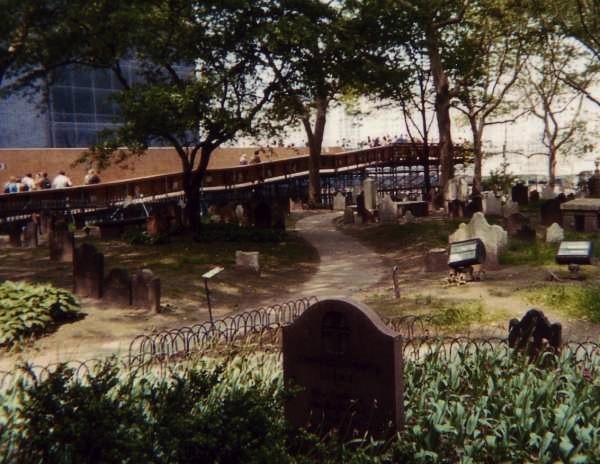 At a certain point the City built a ramp running along the cemetery in the back of St. Paul’s Chapel so people would be able to look into the pit at ground zero. I absolutely understood the need to look, so I’m not judging, but it was very weird for those of us working at St. Paul’s, and it must have been even weirder for the people working in the pit itself, to see this parade of spectators looking down at you. A lot of people hated it, but I knew if I wasn’t working at the site I would have been one of the people on that ramp. I took this shot from the back door at St. Paul’s. (I didn’t own a decent camera at the time.) I just remembered, people would smile and pose for pictures when they got the end. Okay, that was a little messed up. But people are so oblivious (myself included).